Amazing things happen when we open to receive the good that abounds. Last summer, I said YES to perform at a music festival in Brønnøysund. It took three days to drive there with my sweetheart in a super cool electric Nissan Leaf and three days to drive back, across the beautiful mountains of Norway. And, as I thoroughly enjoyed the whole festival experience and appreciated all the aspects of the journey, I received another proposal. 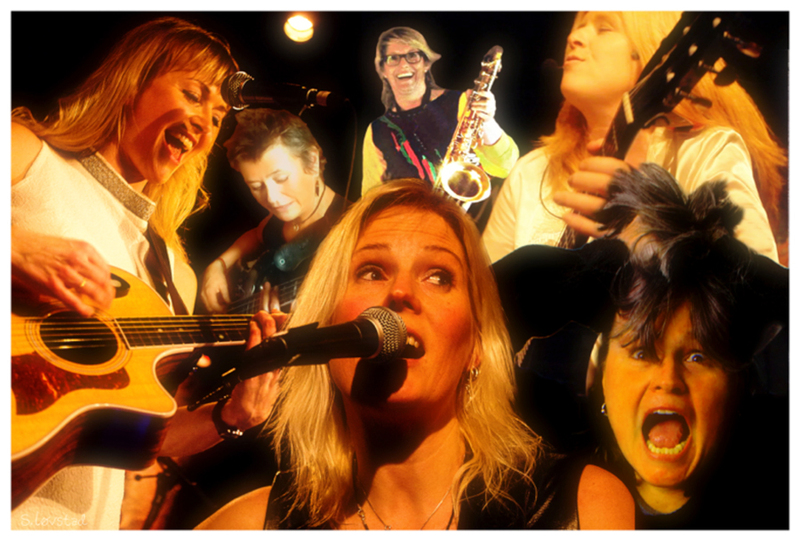 A group of extraordinary women musicians asked if I wanted to join them in a band. Again, I said YES. Our band name is Engla & Banditta, which in English means Angels and Bandits. The name itself is significant for many reasons. In addition to our music being incredibly expressive, deep, joyous and diverse, ranging from Bluesy Rock to Jazzy Pop, we have a fierce social engagement and a soft spot for the underdog. Banjo- and guitar playing Tove Bøygard, who sings in real Halling, is improving the lives of drug addicts and prostitutes as a social worker. Bass- and castanet playing Venja Ruud Nilsen and sax tooting Bente Mari Mortensen are improving the lives of women prisoners as music therapists. Swedish singer/songwriter and electric guitar player Sara Andersson teaches and performs with extraordinary depth and compassion. Legendary drummer Metch Johannessen fights for the downtrodden with every beat of her heart and drum. And I, in addition to sharing my own personal story of overcoming adversary in Finding Venus, give seminars and teach Vocal Freedom for anyone and everyone who wants to heal from post-traumatic stress, find/ strengthen their voice and let their heart sing with no holds barred. Engla & Banditta recently completed our first concert series, with performances at Iris Scene in Odda, Bredtveit Women’s Prison and Herr Nilsen in Oslo, Norway. The audience response has been amazing and we are now getting ready for a delicious summer of joyous expression in both Norway and Sweden. If you would like to book us for your event, party, club, stage, TV or radio program, let us know via booking@englaogbanditta.com. Chances are, if schedules allow and the price is right, we’ll say YES! Click HERE for a video teaser from one of our shows in Oslo!